Eager gym-goers and researchers have also wondered about another nutrient-timing concept: if there’s a “best time” to eat. For years, most nutrition experts told people to eat more of their calories and carbs at breakfast, and to keep calories — and especially carbs — lower at night. The research in this area remains limited, but it is interesting. A recent study asked: Does it matter whether you eat half your day’s calories at dinner or at breakfast? And, by “matter”, the researchers mean: would it affect body weight, waist circumference, appetite, and several blood markers of glucose tolerance and insulin sensitivity? Well, the group who ate half of their daily calories at breakfast lost more weight and more inches from their waists, showed greater improvements in glucose control and insulin sensitivity, and reported being more satisfied (along with having lower levels of grehlin, our main hunger hormone). Wow. Clearly eating more calories at breakfast is the way to go, right? Not so fast. The “carbs and calories at dinner” folks can also call on research to support their views. Take, for example, the Journal of Nutrition study that compared eating 70% of your calories at night versus eating them at breakfast. In highly controlled settings, where all subjects completed resistance and aerobic exercise, the calories-at-dinner group retained more muscle and lost an equal amount of body fat to the calories-at-breakfast group! Not only that, but more recently, a six month study found that weight loss, waist circumference, and body fat loss were all greater when the majority of the day’s carbohydrate intake was at night, rather than spread evenly throughout the day. The “more carbs at night” protocol was also better at improving glucose control, markers of inflammation, blood lipids, and appetite. So who’s right? The breakfast advocates or the dinner advocates. Well, it depends. Some research has found breakfast to be the best time for big meals (3 studies), some has found no differences in weight loss between big breakfasts and big dinners (2 studies), and other research has found significant benefits from eating more at night (2 studies). What can we discern from this contradictory mish-mash of findings? We’re all unique. There’s no one-size-fits all rule. Indeed, research into circadian rhythms has found that humans (and animals) vary a lot in their natural sleep-wake cycles. So why wouldn’t the same diversity be true of our natural feed-fast cycles? Follow your evidence. Track your experience. Do what works — measurably — for you. Flow with your natural inclination, and where your own self-experimentation takes you. If early sunshine and scrambled eggs gets you through the day feeling awesome, great. If a robust dinner is more your thing, enjoy drifting off to sleep with the warm fuzzy feeling of a full belly. Just like when you exercise, what’s most important is you make high-quality choices, consistently, whenever it works for you. But what about… no breakfast? The “calories at breakfast” vs. “calories at dinner” debate also raises the question: What about skipping breakfast? Wait a minute. No breakfast? Surely everybody knows that breakfast is the most important meal of the day! And, in particular, that it’s a good idea to eat most of our carbs in the morning. Well, at least that’s what my grandparents always told me. Behind this recommendation lies the notion that by breakfast time, we’ve fasted for eight to twelve hours. Our bodies are therefore primed to use nutrients (and especially carbs) more effectively than at other times of the day. Our glycogen levels, especially those in our livers, are running low. Plus, some evidence does suggest that we use carbohydrates more effectively in the morning than at night. So it seems only logical to make sure we take in more carbs at breakfast than at dinner. Right? By now I hope you see how this argument falls apart. It’s not that having breakfast is wrong; or that having carbohydrates at breakfast is wrong. In fact, both choices are just fine. What’s wrong is the assumption that what works for you is necessarily what’s best for everyone. While almost everyone in nutrition, for the last 20 years, has repeated the “breakfast is the most important meal of the day” story, it turns out that this argument in favor of breakfast is actually quite weak. The only support comes from correlational research (X and Y happen at the same time), and not causal research (Y happens because of X). And that makes the “evidence” flawed. In a recent American Journal of Clinical Nutrition paper, researchers analyzed dozens of studies to look at the relationship between breakfast and body weight. That doesn’t sound terribly definitive, does it? Of course, just because one study came to a certain conclusion doesn’t mean the case is closed. So let’s take a closer look at some of the proposed benefits of eating breakfast. If we stopped there, of course we’d assume that skipping breakfast is a dumb move. However, we can’t stop there. Because, again, most of this evidence is observational. It suggests there’s a relationship — a correlation — without proving a cause. The strongest of this evidence suggests that breakfast is most important for malnourished or impoverished children. But, for other populations, it seems to be just another meal. No better. No worse. Completely negotiable. Folks with Type 2 diabetes did better when they skipped breakfast altogether and ate a larger lunch. And skipping breakfast was found to be just as effective as eating breakfast for weight loss. So, will skipping breakfast be better for you? However, the truth is, most of this research has been done in animals, with only a few conclusive human studies. So, while intriguing, there’s certainly no guarantee that these changes in our physiology will actually lead to long-term benefits. In fact, if there’s one thing we can say for sure, it’s that immediate changes like these can often be deceiving. Often the body “corrects” for them later — seeking homeostasis. In other words, acute changes don’t always lead to chronic ones. That’s why short-term effects from nutrient timing protocols don’t always translate into the long-term changes we’re hoping for. Is changing your breakfast routine most important? Finally, a recent study offers a fascinating postscript to the breakfast and weight loss question. Guess what? The groups whose habits and routines were changed were the ones with the most substantial weight loss. The people who normally ate breakfast and skipped it during the study lost weight. And the people who normally skipped breakfast and ate it during the study lost weight. Ultimately, this study showed that when people become more aware of their intake, they get better results — whether they eat breakfast or skip it. So in the end, eating or skipping breakfast is purely a matter of preference. There is no right or wrong choice, as long as whichever choice you make is actually helping you improve your health, performance, and body composition. Let’s explore one more “nutrient timing” idea. In college I ate eight times per day. Yes, eight! From early research we assumed that eating often would speed up the metabolism, help control the hormones insulin and cortisol, and manage the appetite. As long as we eat the right foods in the right amounts, meal frequency seems to be a matter of personal preference. You can eat lots of small meals each day (i.e. every few hours). Or you can eat a few big meals each day (i.e. with bigger time gaps between them). And there’s almost no physiological difference. There could be psychological differences, mind you. Which is why I highly recommend listening to your own body. And why not apply JB’s famous “How’s that workin’ for ya?” test. If you’re covering all your other bases and your current meal frequency isn’t working, try switching it up. Experiment with fewer meals if you eat more frequently. And more meals if you eat less frequently. Because either approach is physiologically valid, you’re free to find the lifestyle approach that works best for you. 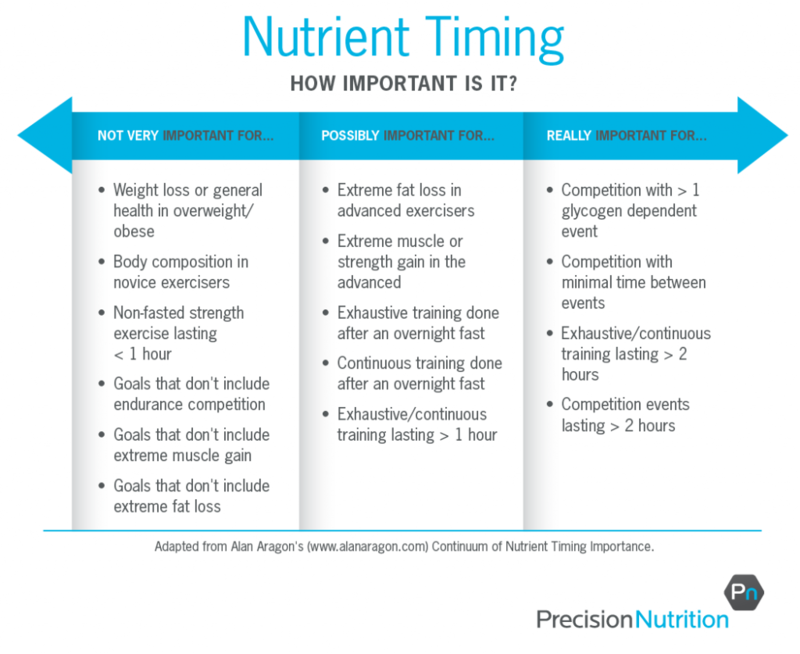 Make no mistake, nutrient timing is a complex subject. It’d take an entire book to cover it exhaustively. So, for now I pose this question: Is nutrient timing dead? Nutrient timing can be helpful. Or it can add layers of unnecessary complexity. It all depends on the context. If you’re a bodybuilder or endurance athlete, the meaning of nutrient timing is much different than if you’re an overweight office worker just getting into exercise and trying to improve your nutrition. Indeed, if you’re just starting out — and looking to get healthier and more fit — you don’t need specific nutrient timing protocols. At that point in the game, there are more important things to do. Here’s a helpful prioritization checklist. Are you doing #1 to #4 properly, consistently? As you can see, nutrient timing makes the list, but it’s at the bottom. Timing your nutrients can help, but only if you have the other — and much more important — aspects of your eating in order first. Some people are already very lean, compete at the elite levels of physique or athletics, and have nailed down items #1 to #5 above. For folks like pro bodybuilders, physique competitors, and/or weight class athletes, an extra half-percent of body fat can mean the difference between winning and losing. These athletes often engage in training or events lasting longer than two hours at a stretch, where added carbohydrates, electrolytes, and a little protein can go a really long way. If you’re not an “elite eater” or athlete, you can still benefit from nutrient timing if you’re doing more than one activity session a day. For example, perhaps you’re competing in a tournament with multiple bouts, or spending a day having outdoor adventures — hiking in the morning, whitewater rafting in the afternoon, etc. In this case, you’ll want to time your intake a little more precisely, to take advantage of both the post-activity “refill” window as well as the non-active periods when you can “rest and digest” most comfortably. For most of us, most of the time, nutrient timing demands extra effort, requires additional planning, and adds dietary complexity… with minimal return. Also, the best nutrient timing in the world won’t compensate for a poor-quality, mindless, and/or inconsistent intake. That’s why, at Precision Nutrition, we’ve transitioned away from emphasizing the PW and AT distinction for most clients, especially those enrolled in our PN Coaching programs. Our experience with thousands of clients, and new scientific evidence, show us: For most people, nutrient timing is not a main priority. This chart, adapted from Alan Aragon, explains. The nutrition world can be pretty complex. But, we like to keep it simple. We like clients to think less about food decisions. And do more of the few essential behaviors that matter. Consistently. Again, here are your nutritional priorities, in order of importance. Focus on mastering #1 to #4. For help on how to do this, check out our Calorie Control Guide for Men and Women as well as our example Precision Nutrition Plate. And then, only if you need to, consider adding some basic nutrient timing. Otherwise, enjoy eating what you’re eating, whenever it suits you best.